This is our second year to get a 27 game ticket package for the Astros. Two seats. We - various nearby family members - alternate going to the games, on no specific basis. Kinda along the lines of whoever is available and wants to go. 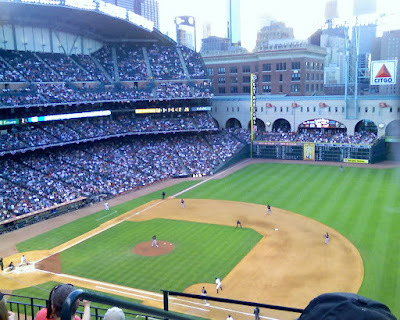 Last year, as it turned out, we had tix to some pretty good games - opening day, closing day, the day Biggio announced his retirement, and the big one, the game he got hit number 3,000, plus a few more. So, we got the same seats this year. Third level, first base side, convenient to the ramp, the elevator, the restroom, the nacho stand, and the 24 oz. beer cart (although she may have moved for this year - dang!). Anyway, my bride and I went tonight - 'Stros vs. Marlins. With 34,000 of our closest friends. Actually, we had a third with us as well - Flat Stanley. I knew absolutely nothing about Stanley until we got him from a grand nephew in Indiana. Third grade class project - "we", and I use the term pretty loosely, 'cause it's not me, get Stanley for his Texas trip. "We" photograph him at various locations, and then send him and the pix back to the kid as a record of all the places Stanley visited - school, happy hour, the library, sitting around the pool, and, of course, the ball game. We won - saw a 2-run homer, couple of running catches in CF (one running in, one out), and a couple of nice double plays. Hot dogs, peanuts, cotton candy (none for me - it gets in my mouth), a beer, a Coke Zero (they have Coke Classic, Diet Coke AND Coke Zero). All in all, a very nice evening - beautiful spring day in Houston. Had the roof open at Minute Maid (nee Enron Field). Photo above before it got dark. This was Game 3 of our package - 24 to go. Plus we scored some extra single game tix for the Red Sox and Yankees series. A very pleasant and successful evening, from a baseball, culinary and Flat Stanley perspective.